Kadaknath or black chicken is high in demand due to low fat (0.73%-1.03%) and cholesterol contents, while other chicken breeds have fat content ranging from 13% to 25%. Call it Kadaknath or Kali Masi, the trend of black chicken is slowly picking up at the restaurants in India. Kadaknath is suddenly in limelight for all good reasons this year. It all started when the Board of Control for Cricket in India (BCCI) suggested Team India players to include black chicken, a healthy option, in their diets. Why the Sudden Talks over Kadaknath? Kadaknath is an Indian breed which is prominently found in Jhabua and Dhar districts of Madhya Pradesh. It is also called as Kali Masi as it is the fowl with black meat. - It’s a healthy option and scientists from Jhabua’s Krishi Vigyan Kendra (agriculture knowledge centre), have given their consent too. - It is high in demand due to low fat (0.73%-1.03%) and cholesterol contents. It is high in protein, iron and amino acids. Other chicken breeds have fat content ranging from 13% to 25%. - Jhabua’s Kadaknath chicken has also got the geographical indication (GI) tag. The Government of India approved of the GI tag on July 30th, 2018, making it the only animal to have a GI Tag in the country. - Taking a step-ahead to promote the black chicken aka Kadaknath, the Madhya Pradesh Government will soon start selling it from the official counters in Indore and Bhopal. In order to promote the sale of black chicken, it will be made available in live, dressed, marinated and ready-to-cook options. Kadaknath is reared at the farmhouse of Madhya Pradesh State Livestock and Poultry Development Corporation located at Raisen Road in Bhopal. It is originally reared by the tribal community of Bhilalas and Bhils in Jhabua and Dhar districts. Sagar Neve, Restaurateur and Director at Esora, Mumbai believes that the black chicken breed is rare which makes it difficult to source for hotels and restaurants. “There has been a considerable increase in the demand of the black chicken in the recent times in the country,” says Sagar. “While the Government has been making efforts to promote the sale of Kadaknath chicken, there are few restaurants and hotels that serve the chicken in the country. 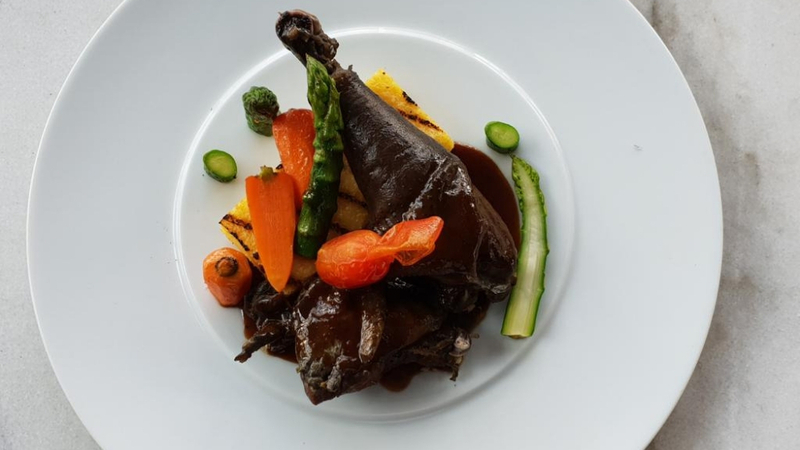 The market in India is still not active enough for this breed but after the hotels have started incorporating black chicken in their menus people will start knowing it better,” says Roberto Apa, Chef De Cuisine, Bene, Sheraton Grand Bengaluru. The government rates for black chicken are 800 for female and 700 for male each, whereas it almost doubles with private sellers. The private sellers’ price for black chicken varies between 1200-1500, each. What is the Taste of Black Chicken Like? Wondering yet? We got the answer from the food industry experts. “In the restaurant industry, many hybrids have gained hype for all right reasons. Kadaknath Chicken, apart from being very healthy especially in winters, is the meat of a matured chicken. It is very tender, and its taste and texture are quite subtle as compared to white chicken. The only difference is, Kadaknath’s meat is harder and stretchy,” says Restaurateur and Chef Mujeebur Rehman. “I look forward to restaurants to include Kadaknath Chicken in their special menus,” he adds. Executive Chef Aniket Das, Aloft Bengaluru Cessna Business Park, to make the diners aware about the Indian breed says “we display the story via personal interactions with our guests”. So, the question is – if the meat is hard, then how it could be cooked? Chef De Cuisine Roberto Apa suggests, “Due to less content of fat the meat tends to get tough if we cook it in the way of roasting so we cook it in Sous Vide cooking pot.” “The fat marbling in the meat is not enough as compared to other chicken making it little more time to cook,” he says. Mujeebur Rehman tells he had served Kadaknath Chicken at 4-5 food events. He noticed that people who are more experimental and like to have rabbit, emu or quail were interested in trying out Kadaknath chicken as well; people like it as korma. “Under Indian cuisine dishes such as Biryani and Murgh tariwala are well in demand. Kadaknath chicken Chettinad is a south Indian dish that is ordered pretty often in our all-day dining Nook,” says Executive Chef Aniket Das. Restaurateur and Chef Mujeebur Rehman believes, with social media talking about the breed, it’s not much complicated to spread awareness about Kadaknath chicken. “People who eat desi chicken or Turk (Murgabi), love Kadaknath a lot. The consumption is more in South India and Madhya Pradesh. As people are becoming experimental, I have seen, they want to explore the flavours of Kadaknath too that I have been serving during food events and festivals,” he says. “Although kadaknath chicken which is one of the native India breeds has been around for a long time. The consumption is literally non-existent compared to the organised poultry sector and consumption of broiler chicken. In recent months, it has gained some mind share with the consumers owing to its unique characteristic black outer and inner colour,” says Narendra K Pasuparthy, Chief Farmer and CEO, Nandu’s Chicken. Narendra further adds, "As an industry leader in poultry breeding and broiler production, we see kadaknath chicken as a passing fad/fancy which will settle down in time." Narendra is of the view that "Kadaknath chicken has existed in the past and will continue to be produced to meet small pockets of demand in rural India and be served as a novelty item in urban India." "In addition to the above, the production of kadaknath chicken is very unorganised and fragmented which may not be able to meet the demands of the organised sector which will demand consistent and quality supply of kadaknath chicken," says Narendra.